Discussion in 'Seasoned Marijuana Users' started by VoodooBud, Apr 14, 2006. Could somebody PLEASE show me a close up of a perc and tell me a little bit about how it works??????? ps what is dichroic glass? Use the search feature, man. Heh. This is the second thread on this in the past week. As for dichroic glass, I'm not sure how it's made, but it has a weird, bumpy feeling (almost like a bunch of bubbles popped on the surface). If you've seen it they use it for a lot of modern "stained-glass" pictures that you can hang from your wall and let the sun spread it's colors around your room. Never seena piece made of it though, or at least never recognized it. "Percolation is exactly what a water pipe (bong) or wet bubbler does best: it runs a stream of smoke through at least one chamber of water, creating a percolating effect that cools the smoke and allows the water soluble compounds like carbon monoxide (slightly soluble) and carbon dioxide (soluble) to dissolve in the water. This technique has obviously been around quite some time - about as long as water pipes, which themselves are pretty ancient. Double-bubblers and their kin took this to the next level. The logic being: if one level of filtration is good, two are better. 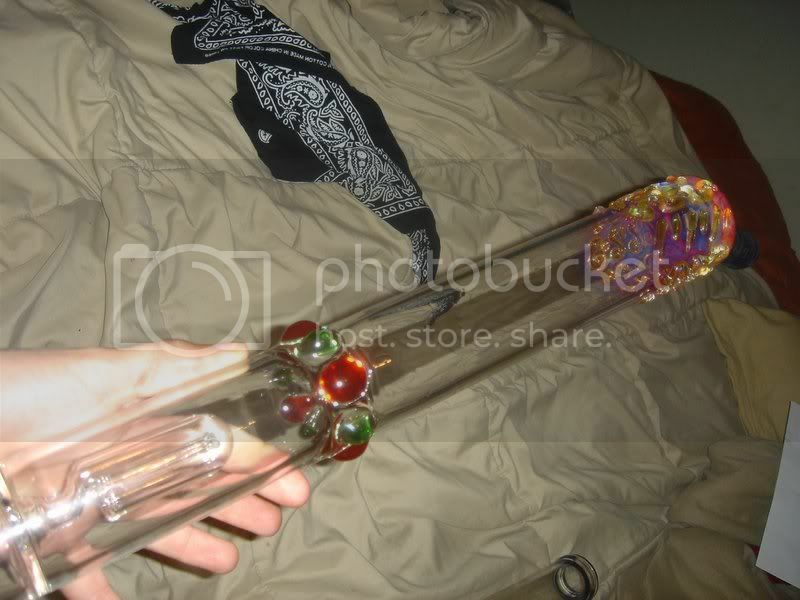 Handheld double-bubblers and double chamber water pipes were state of the art designs until several significan innovations were introduced to the market. First, diffused downstems pervaded the water pipe world with RooR taking the lead in popularizing the new technology. The diffused downstem changed the way the pipes functioned by forcing the smoke from the bowl through a group of little holes - rather than one big one - before entering the water chamber. The cooling and filtering that takes place in a water pipe occurs on the surface of the smoke bubbles, therefore the more surface area you can create the better. Lots of little bubbles have more surface area, which translates to more efficient cooling and filtration, and ultimately smoother hits. In 2003, a new pipe came on the market that combined the twin concepts of diffusion and multiple chambers. Initially started as a senior design project by a mechanical engineer at UC Berkley, the pH(x) Trinity embraced the concept of diffusion and extended it to not one, but two additional chambers. These "percolators" or percs are the engine behind the pipes superior filtration. pH(x) also added a splashguard to shield the users mouth against bong water. The filtering device on the pH(x) was a leap ahead of anything that existed at the time. With its domed percolator design, the pH(x) made the average hit silky smooth and previously impossible monster hits possible. The design sets the standard for innovation in the realm of smoking glass, and has spawned a host of follow up designs by other companies looking to mimic pH(x)'s success with multi-perc pipes." there you have it. page 100 Vol 6, Issue 3. There are two designs to the perc. There is the PHX design (shown above) and the Bluedot design ( http://i2.photobucket.com/albums/y7/skthrilla/DSC01995.jpg ). It works just as debauch said. It's basically a second (or third) bong inside a bong. I get how the blue-dot style works, but I still don't get the pH(x) one.